Super Apple Cider Vinegar + Diet is a combination formula designed to help control weight by burning fat and reducing sugar cravings. Sometimes sensible eating and regular exercise aren’t enough when it comes to winning the weight loss battle. Fortunately, Super Apple Cider Vinegar + Diet is on your side. It combines apple cider vinegar with green tea, calcium pyruvate, kelp, dietary chromium and vitamin B6 to help control weight by burning fat and reducing sugar cravings. Apple Cider Vinegar: Apple Cider Vinegar or ACV has been used to remedy numerous ailments. 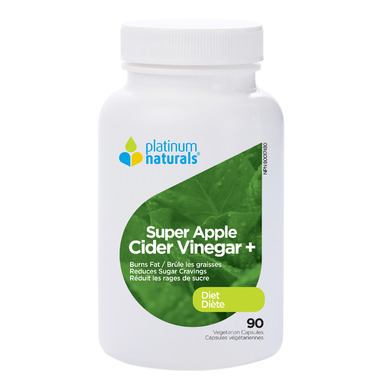 For thousands of years, apple cider vinegar has been used to aid digestion and support weight loss. Studies found that people who consumed vinegar along with bread felt more full than those who did not. Green Tea: Green tea, known for its antioxidant properties, plays an important role in weight loss. Green tea contains compounds that specifically contribute to thermogenesis and fat oxidation. 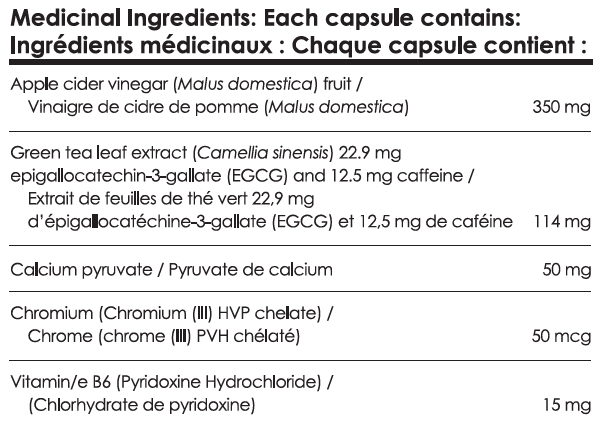 These compounds contain the antioxidants known as flavonoids including catechin and epigallocatechin gallate (EGCG). Chromium: Chromium participates in glucose metabolism by enhancing the effects of insulin, which controls blood sugar metabolism. If glucose levels are high, the body stores it as fat instead of burning it. In addition to facilitating carbohydrate metabolism, insulin also aids the metabolism of protein and fat. Vitamin B6: Vitamin B6 aids weight management in three important ways. Firstly, vitamin B6 is involved in the metabolism of proteins, carbohydrates and fats. Secondly, vitamin B6 is needed to ensure proper digestion. Lastly, vitamin B6 helps to maintain healthy thyroid hormone levels. Vitamin B6 is involved in the process that converts iodine into thyroid hormones. Recommended Adult Dosage: Take one capsule three times daily. Caution: Consult a health care practitioner prior to use if you are pregnant, breastfeeding, have a thyroid disorder, are taking blood thinning medication, or are taking levodopa. Contains Green Tea: Consult a health care practitioner prior to use if you have a liver disorder or develop symptoms of liver trouble (such as abdominal pain, dark urine or jaundice) or if you have an iron deficiency.